Is an ITIL Certification Worth It? Is the cost of an ITIL certification worth the benefits? Should you invest in ITIL Foundation, or try to become an ITIL Expert? We take a look at the real value of ITIL training. Is Studying for an ITIL 4 Certification Worth the Time and Cost? The ITIL framework has long set a global standard in IT Service Management (ITSM). It is a best-practice framework designed to help organizations to maximize the value of their IT-enabled services and products, guiding their development, maintenance and alignment with crucial business goals. At the same time, the framework is non-descriptive, allowing practitioners to adapt it to suit their needs without having to follow any stringent rules. By adopting the framework, organizations can create more efficient, lean and targeted operations. This, in turn, can help them to deploy IT services of a higher quality and at a much faster rate. More importantly, ITIL encourages an atmosphere of continuous improvement, helping users to continually reassess and boost the value of existing services whenever opportunities appear. With most industries now relying on IT to at least some degree, ITSM frameworks like ITIL have no shortage of potential students. Naturally, the most important question that they have is whether or not ITIL certifications are worth the cost of investing in training courses. This can be doubly important for professionals planning to invest their own money, as choosing the right course could provide a serious boost to their career prospects. Even ITIL Foundation certifications can create opportunities in ITSM and project management, allowing users to build up the experience required to eventually take on senior management roles. 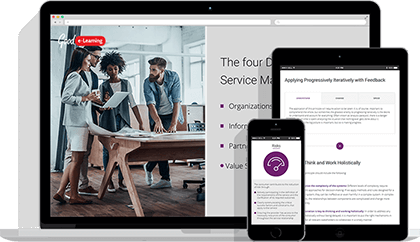 With the latest iteration of the framework, ITIL 4, set for release throughout 2019, there is a great deal of new interest in ITIL certifications. With that in mind, let’s take a look at whether ITIL certifications are really worth the costs. The flourishing ‘Digital Age’ has triggered major changes in the world of business. IT-empowered products and services have become an integral part of our daily lives. More importantly, the power offered by IT and digital assets has made it far easier for flexible and forward-thinking companies to gain a leg-up on static competitors. ITIL 4 is a comprehensive framework designed to ensure that organizations can meet the challenges of the 4th Industrial Revolution. It offers an end-to-end model for digital and IT operations, allowing organizations to deliver top-tier IT-enabled products and services quickly and efficiently. It also covers incident and problem management, helping users to avoid costly errors or, when necessary, resolve them as soon as possible. Compared to ITIL V3, ITIL 4 has a much greater awareness of modern ITSM practices. For one, it emphasizes integration with other popular frameworks, such as DevOps, Lean and Agile. The ITIL community has also had a hand in developing the framework and will continue to provide advice for practitioners as both ITIL and ITSM in general continue to evolve. In other words, investing in ITIL now could have ongoing long-term rewards. An important advantage that ITIL has over the competition is its certification path. Students will start with ITIL Foundation (worth 2 credits in V3), an entry-level qualification designed to provide an introduction to the framework, its purpose and its key processes. The question of how much an ITIL foundation exam costs is a common one, though with Good e-Learning the exam can be taken free of charge! Once a student has collected 17 credits, they will be eligible to take the ITIL Managing Across the Lifecycle (MALC) exam, which is worth 5 credits. After a student passes this exam, they will have earned the designation ‘ITIL Expert’. According to Indeed, the average salary for professionals with this certification can range from £30,000 - £65,000/ $85,100 - $135,300. Students studying ITIL 4 will take a slightly different approach. There are two branches for intermediate modules: ‘Managing Professional (MP)’ and ‘Strategic Leader (SL)’. Both branches also contain the module ‘ITIL Strategist - Direct, Plan & Improve’, though students will only need to pass this once. If a student passes every exam in both branches, they will be eligible to reach the ‘ITIL Master’ level. More information on how to achieve this is set to be released by AXELOS this year. It is worth pointing out that ITIL V3 certifications will remain valid even as the rest of ITIL 4 is released. Those who hold Expert certifications will also be able to take the ‘Managing Professional (MP) Transition’ module in order to bring their knowledge and qualifications in line with the newest iteration of the framework. So What is the Value of an ITIL Certification? Naturally, this kind of salary cannot be achieved with a certification alone. A candidate will also need evidence of their ability to implement ITIL in practice, as well as a certain amount of experience, to reach upper-tier management positions. Rather than treating ITIL as a shortcut or cheat sheet, ITSM practitioners should see it as a valuable tool, as well as an opportunity. With so many organizations investing in solid ITSM nowadays, an ITIL certification has the potential to open up a variety of avenues, most of which will provide practitioners with the experience they need to advance their careers. In terms of the value that ITIL certifications hold for organizations, it is better to consider the benefits of using the framework. How Much Does an ITIL Exam Cost? If you are interested in gaining an ITIL certification, it will be important for you to do so with an accredited training organization. There are many corporate training and elearning companies which profess to offer cheap courses that can get you qualified quickly, but most of the time these courses will be low-quality, or they may even be non-accredited. As such, when researching how much an ITIL certification costs, you will want to avoid options which seem to be undercutting the competition. Good e-Learning is an award-winning online training provider with a wide portfolio of ITIL and ITSM courses. Each course is easily accessible, even on mobile phones and tablets, and students can also enjoy 24/7 tutor support from our in-house team of experts. Want to learn more? View our full portfolio of ITIL courses, or find out more about corporate ITIL 4 training!